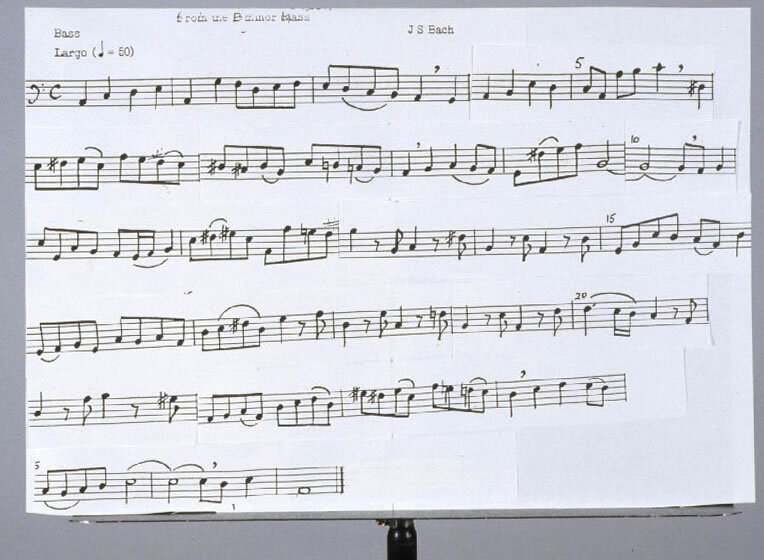 A "big page", magnification 2x, made from a single page of regular music at a copy center. The pole of the music stand on which it is sitting appears at the bottom of the picture. The width of the music staff is the best measure of music enlargement. Music notation computer programs often specify a staff width of 0.28 inches. Some modern music has a staff width of 1/4 inches; older music may be based of a larger staff width of 3/8 inches. A person with macular degeneration or some other form of low vision may only be able to read music with a larger staff width. In the search for a better way to see one's music, the first step to take is to determine how much enlargement is needed. The simplest way to do this is at a copy center. Using an 8.5x11 in. sheet of your music, try enlargements of 130%, 150%, 175%, and 200%. One doesn't need the whole enlarged page to see if a given enlargement is sufficient. If an enlargement less than 200% works, you are in luck. For a 130 % enlargement, just enlarge from an 8.5x11 in. original to 11x17 inches, using maximum automatic enlargement. I was able to do this for a year. However, I needed extra illumination from two music stand lights. A 12 5/8 x16 1/2 in. single sheet of paper from the copy machine will work for a 150% enlargement. For a 200% enlargement, one must cut and paste. One enlarges half the original onto a 17x11 in. sheet in landscape format ( 2x8.5 = 17); this is repeated for the second half of the original. One then cuts the enlarged sheets midway between the staves to make strips. These are pasted onto two fresh 11x17 in. sheets to make a 17x22 in. page which fits the music stand nicely. I call this a "big page". Its area is four times that of the original sheet of music. With a short drive to the copy center, I made such a "big page" in about an hour. What else can be done to make the music readable? One can use telescopic glasses. I got mine from a low-vision specialist. The magnification, 2x, of the lens cap that attaches to the left-eye telescope was chosen to match my 25 in. bass recorder playing distance. The telescopes are attached to a regular pair of glasses and narrow the field of view to a circle of diameter 3/4 inches. In reading a "big page", I scan from measure to measure across the page. This requires some head motion and a corresponding movement of the recorder. In my case an opaque cap covers the telescope for my right eye. I prefer the opaque cap to the much cheaper eye patch. The telescopic glasses are expensive. With the telescopic glasses and a "big page", an overall magnification of twice 2x or 400% is achieved. If this is enough, and the music is all on a single page, the musician with low vision has a viable way to continue playing without spending a lot of time preparing his music. If scores rather than parts are used, one must extract his part by cutting and pasting. In my experience this is not a heavy cost to pay for the pleasure of continuing to make music. If the original 8 1/2 x 11 in. music can be read with telescopic glasses, the player has no more pages to deal with than the others in a group. This is ideal. However, if copy-machine enlargement is required, a page turning problem quickly arises. The more pages in the original part, the bigger the problem. For example, to sight read printed music with a 3/8 in. staff width, using my telescopic glasses, I need copy machine enlargement of 250%. This produces a staff width on the paper of 15/16 inches. For one page of regular music the area of my computer enlarged music is 2.5x2.5 = 6.25 regular pages. This is about 1.5 "big pages" and won't fit on the music stand. I need to stop playing to turn the page unless two stands are used or someone turns the page for me. If, as is usually the case, there are two or more pages of regular music in my part, the page turning problem becomes hopeless. This is why I turned to the computer. End of article. Use your browser's back key to return to the list of sections.